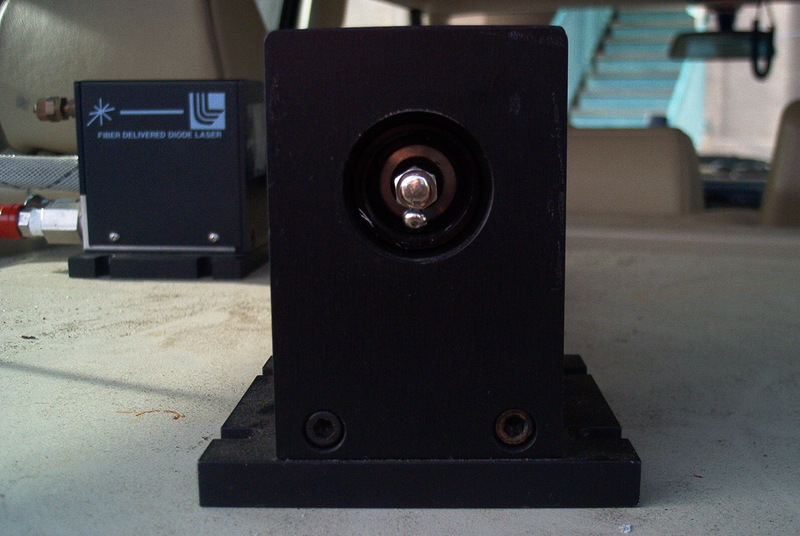 Yesterday Chris Bell and I bought a new laser from the UCI salvage yard. 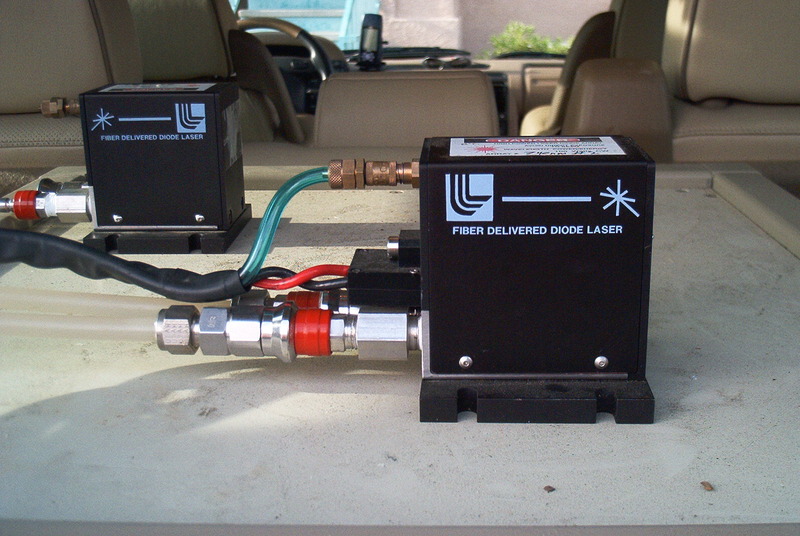 This is added to our first 240 Watt CO2 Laser Cannon, bought from the same place. Supposedly it's fully operational, it comes with two diode heads (Deep red, and maybe Green or Yellow), and the huge power supply. The power supply is a cube about 2 feet to a side. It takes 120v at 30 amps, and needs low pressure nitrogen for some reason. It comes with integrated liquid cooling for the head, and circuits for continious output and pulsed, with a nice waveform generator for pulsed mode built in. 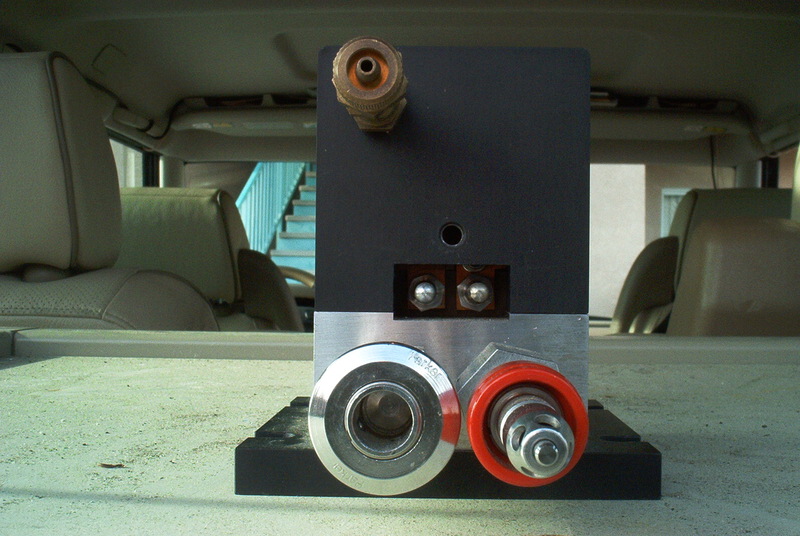 See the first firing at 100 Watt Diode Laser Test Firing 1. Here is the whole thing, in the back of my truck. 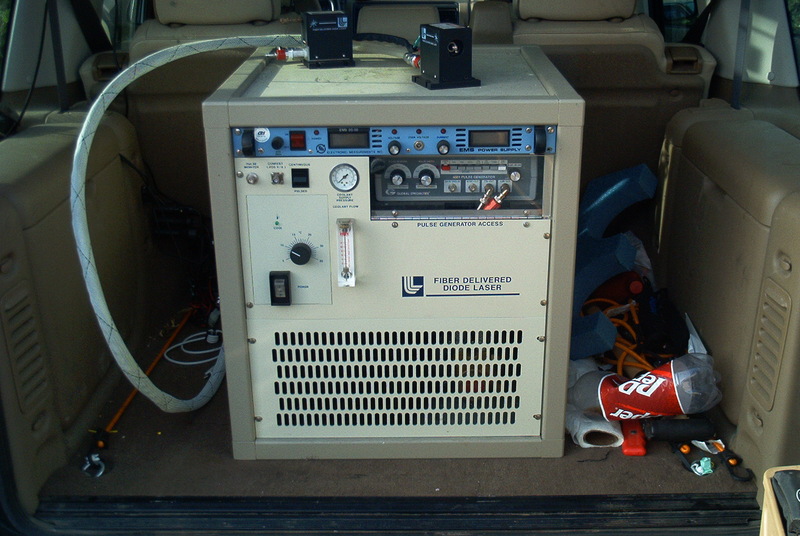 The big box is the power supply, and the two heads are the black boxes on top. The one pointing front is connected to the cooling/power umbilical. 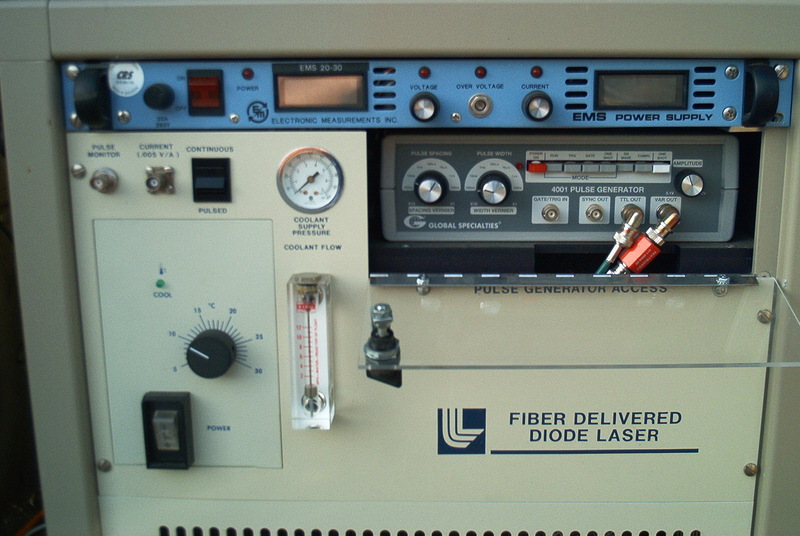 The grey box at the top right of the power supply is the waveform generator. 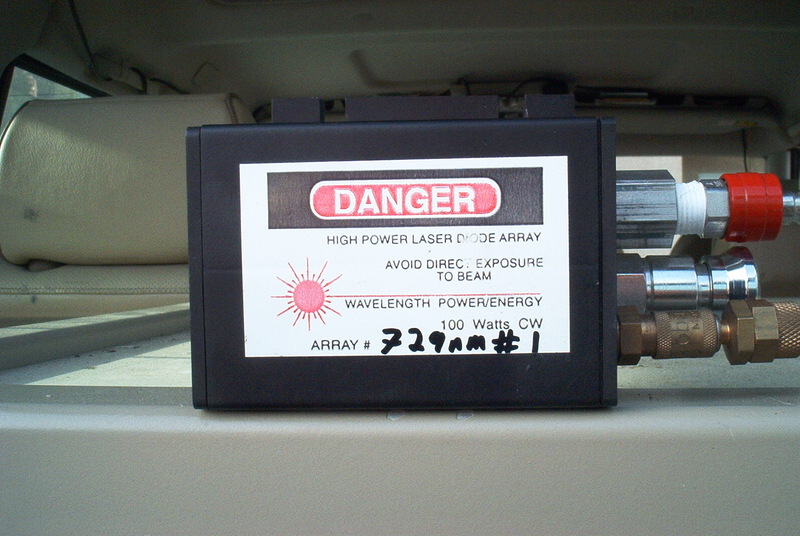 This is the warning sticker on the second head. Nifty eh? Here are the power, cooling, and Nitrogen connectors on the back of the second head. 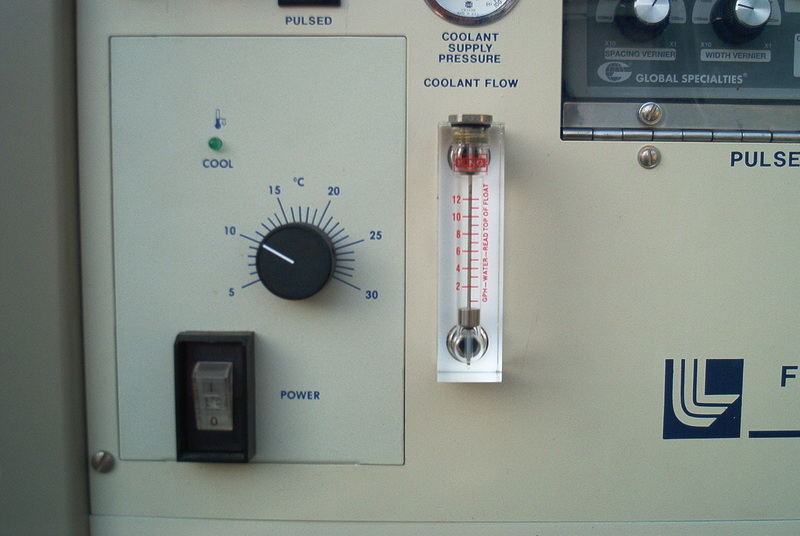 The two bottom are cooling in and out quick disconnects, the top, brass fitting is the Nitrogen quick disconnect, and the two silver posts are the power connectors. Here is the first head connected to the feed umbilical. A closeup of the front of the head. Just a normal fiber connector. 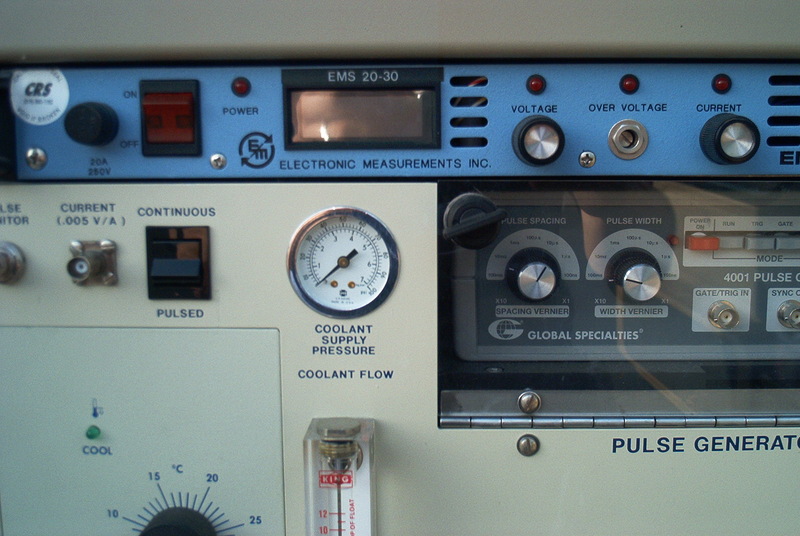 Top left of the power supply instrument pannel. Top middle of the power supply instrument pannel. 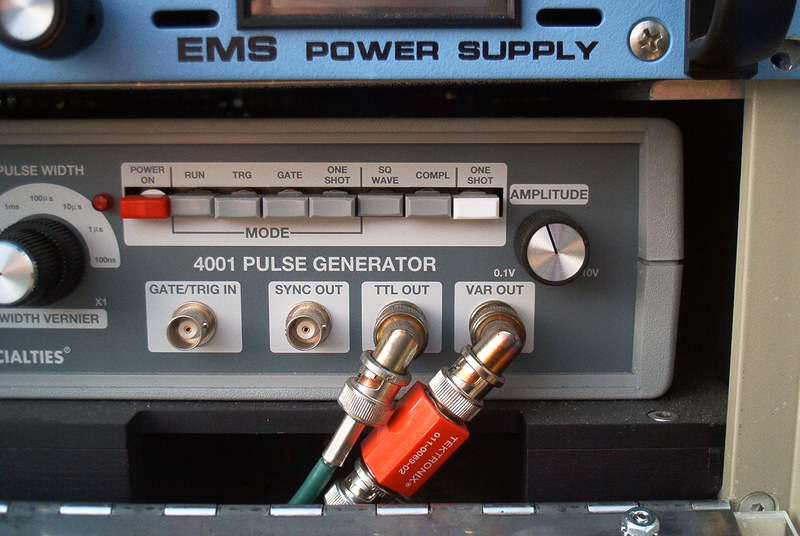 Top right of the power supply instrument pannel. 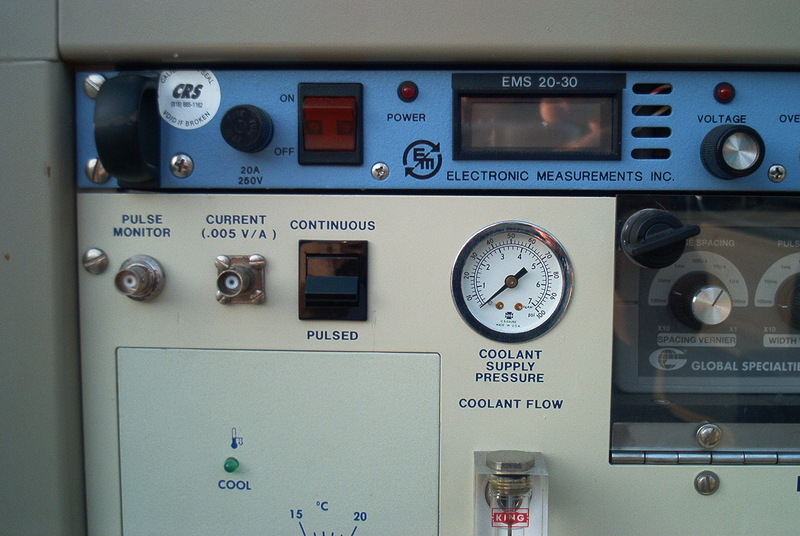 The coolant control pannel, mid-left on the main pannel. 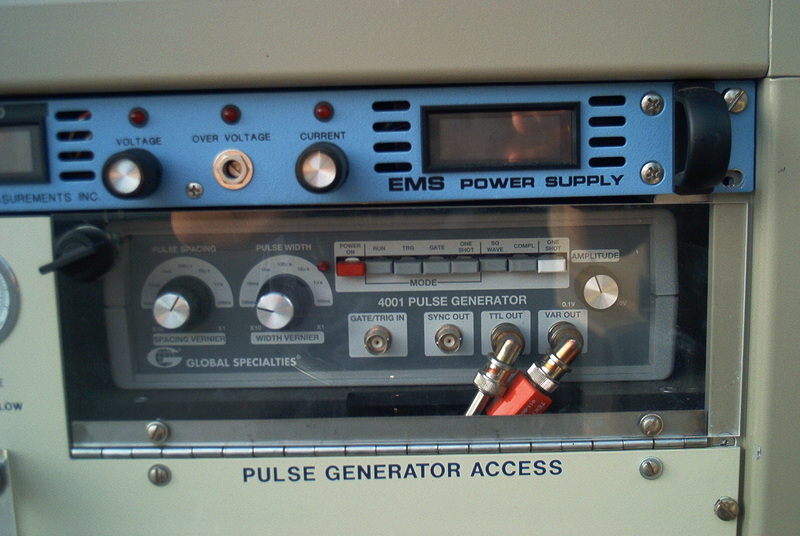 The left side of the pulse generator. 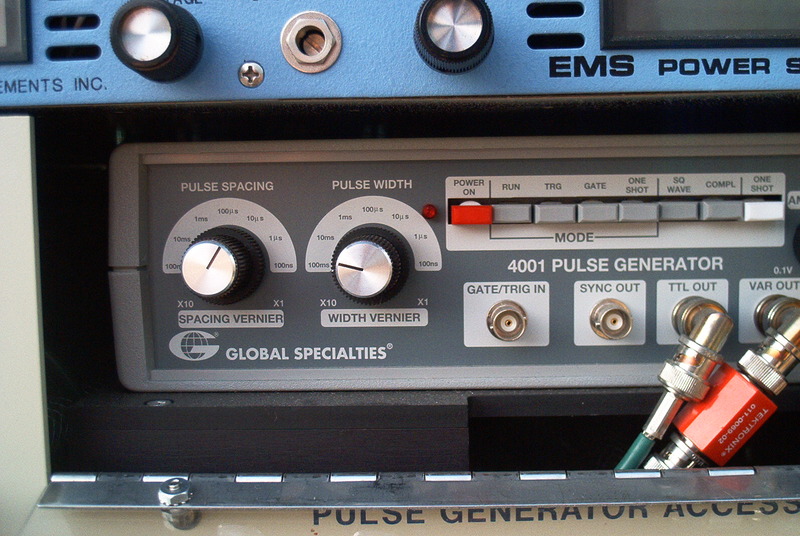 The right side of the pulse generator. The whole power supply front pannel. Matt Bell (2002-04-10): Setting up your own star wars defense shield? scaring the crap out of people. Jon (2002-04-11): When do we get to see it burning through walls? JMB (2002-04-24): I think you should unveil it at the premier of the next Star Wars movie. I'll be standing in line. Erik (2003-06-09): Jag, unfortunately even very large lasers rarely have enough power for mining operations. The biggest lasers I've heard of are the size of warehouses, and are used by the military to weld steel battleship armor that is up to a foot thick. Certainly one of those could help with rock drilling, but it's not terribly portable. jaguar (2003-06-11): thank you erik, well i see. i'll just think of something else by now. you just keep up the good work, i'll be stoping by someday to watch you blast through holes. or maybe you can make a laser that suits my needs... im just kiddn..
Erik (2003-06-12): Thanks Jag, good luck with you treasure hunting! TimLa (2006-04-04): Jag means well, but is suffering cognitive dissonance. Or something. You guys haven't posted in a couple of years. Dead? Erik (2006-04-04): No, just inactive. The laser works though.